With an abundant ecosystem, coastal Georgia takes the bait for some of the best fishing anywhere in the country. It can take years of experience—even for veteran fishermen—to learn exactly what they’ve reeled in. 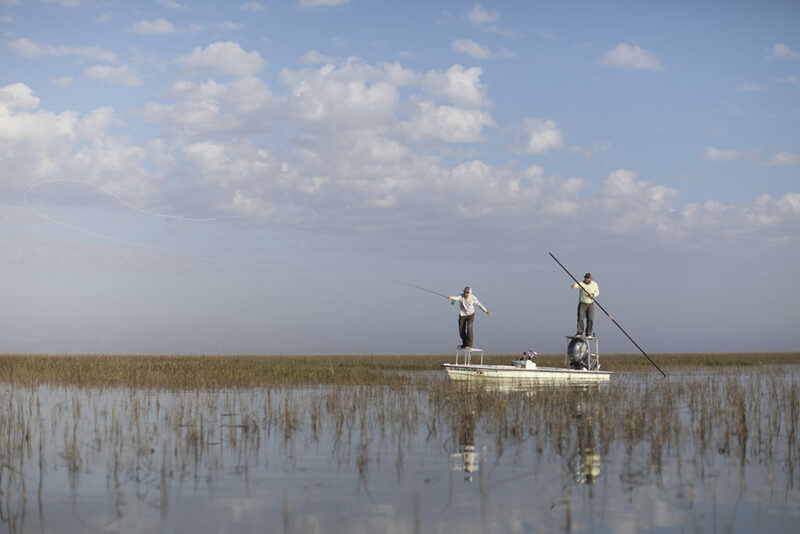 And when you’re fishing at Sea Island, which lies next to the largest salt marsh on the Eastern Seaboard, it could be a multitude of species, from red snapper to blackfin tuna, which call Georgia’s diverse coast home. By whichever means and in whichever waters, chances are good you’ll hook a nice variety of fish, whether from land or boat. Novice anglers often start with dock fishing. Simply drop a baited line in the shallow water, lean on a wooden railing, wait for a nibble that makes your floating bobber dance and reel in your catch, usually something in the 2- to 12-pound range. “We can set you up to cast from the dock right outside [The Cloister],” Kennedy says. The dock extends over the Black Banks River, with its swaying salt marsh grasses, providing a perfect setting to get your feet wet with the sport. Two easy species to identify here are the aptly named redfish (due to its red color) and flounder (notably flat and with both eyes on one side of its head). If you snag a fish whose teeth look remarkably similar to human teeth, that is a sheepshead. Others commonly hooked from the dock include black drum, named for its habit of producing a drum-like croaking sound; spotted sea trout, also called speckled trout, a brownish-gray fish with faint black spots like freckles; and whiting, which has three delicate dorsal fins along its back, sides that can be yellowish, greenish or bluish, and a silvery-white belly. Tarpon also ply tidal rivers like the Black Banks. Shaped like torpedoes with silver sides and blue-green tops, tarpon are incredibly strong, with a reputation as feisty fighters who pull hard on the line and leap into the air. 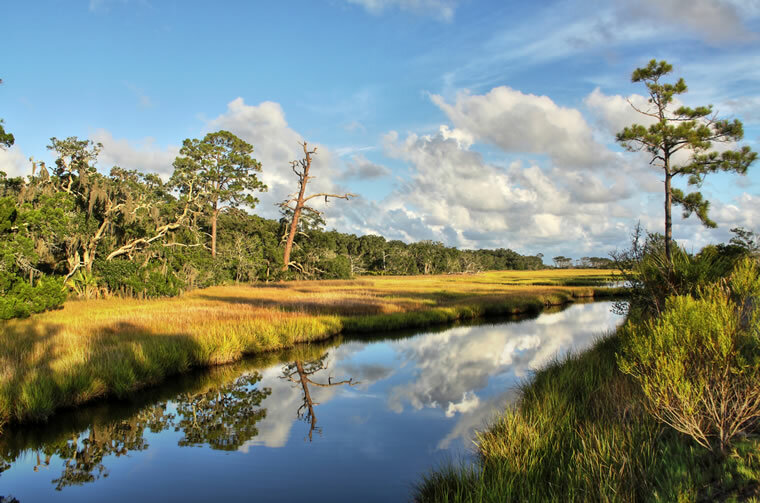 Closest are the fish-attracting salt marshes, where expansive stands of tall spartina grass rise from nutrient-rich pluff mud in the tidal flats, rivers and estuaries that form along Georgia’s coast and barrier islands. 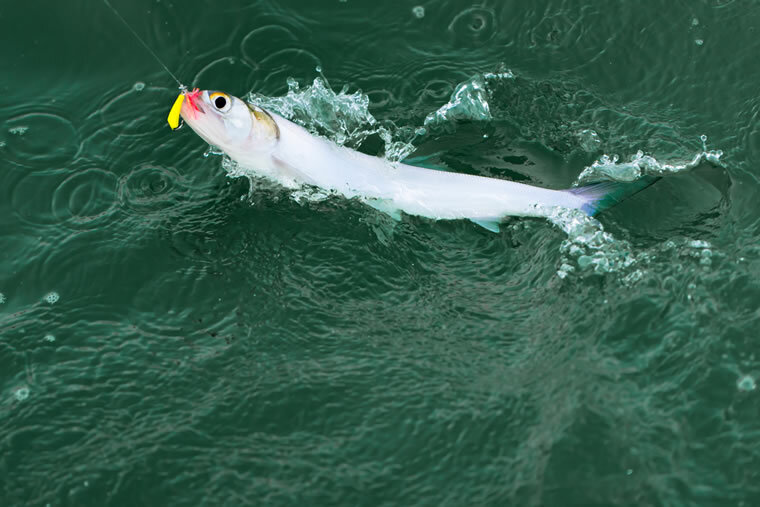 Here, you’ll find the same species as from the dock but also ladyfish; bluefish; Atlantic tripletail, bluntly shaped fish with a trio of fins at their sterns; and schools of juvenile crevalle jack, whose tails sometimes break the surface in unison like a synchronized water ballet. A little farther offshore, fish gather around artificial reefs placed by the Coastal Resources Division of the Georgia Department of Natural Resources. Made from piled chunks of recycled concrete or old barges, tugboats, battle tanks and subway cars resting on an otherwise flat and sandy stretch of ocean floor, the reefs serve as fish-luring habitats. Some reefs are as close as about 4 miles out, in water just 10 feet deep. Others are more like 25 miles out and as much as 75 feet deep. A few are more than 50 miles out and 170 feet deep. Each presents different fishing challenges and requires different choices of tackle. From these man-made reefs you might reel in a 6-pound Spanish mackerel, a prized fighter identifiable by three rows of elliptical yellow spots on its flanks; a 40-pound king mackerel, the Spanish mackerel’s much larger cousin covered with scales so small they’re almost invisible; bonito, whose name is Spanish for “pretty” and whose rigid fins are razor-sharp; cobia, which has the profile of a shark and is arguably one of the tastiest fish; or adult crevalle jack that can reach 70 pounds and the occasional sailfish. Also up to more than 50 miles out from the coast, eight decommissioned U.S. Navy towers that resemble small oil-drilling platforms rise above the water. Their steel legs, reaching 70 to 140 feet down to the sea floor, attract fish and, subsequently, boatloads of anglers. Blackfin tuna are oval-shaped with black backs and gleaming yellow highlights along their sides. The smallest tuna species, they still can reach about 46 pounds, much of it muscle that tests any angler’s abilities. A marlin has a long pointy bill pike a rapier and a stiff dorsal fin, and it can weigh more than 500 pounds. When a marlin goes airborne, it’s quite a sight. If you’re the one busy gripping the rod, you’ll hope someone else thinks to snap photos. As for dolphinfish, they’re not actual dolphins (call them mahi-mahi if it helps). They sport a dazzling array of colors—golden flanks, green backs, iridescent blue pectoral fins—and the males have prominently blunt foreheads sort of like a bulldog’s. 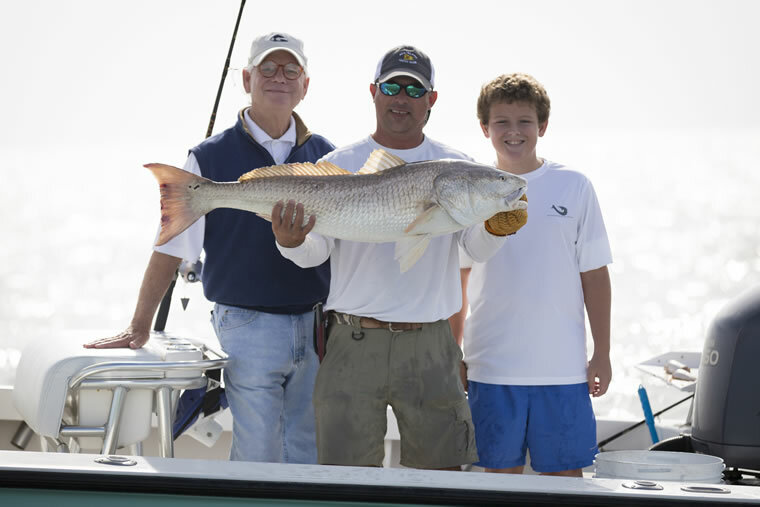 Whatever your fishing pleasure turns out to be, the next time you catch, let’s say, a redfish or a flounder, be sure to hold it up and proclaim with confidence what it is. Catching fish is one thing—cooking it is a whole different matter. If you decide to take the catch-and-release approach during your fishing outing, you can still enjoy the freshest catch for dinner, and without having to worry about cleaning and preparing it. Seafood selections at Sea Island are constantly changing as chefs take whatever fresh fish is available to them on any given day and decide how best to prepare it. Grilled, roasted, seared, steamed, fried, served on a bed of grits or tucked into a sandwich—the options are endless. In addition to certain types of fish you might recognize from your fishing expedition, find lobster, scallops, mussels, crab, shrimp and other seafood. By all means, ask your server for that day’s details at the Forbes Five-Star Georgian Room, Tavola, Southern Tide, the River Bar and other dining rooms. Let them know what a great day of fishing you had, and then trust the cooks to plate something delicious for you.